« Time to stop roaming! 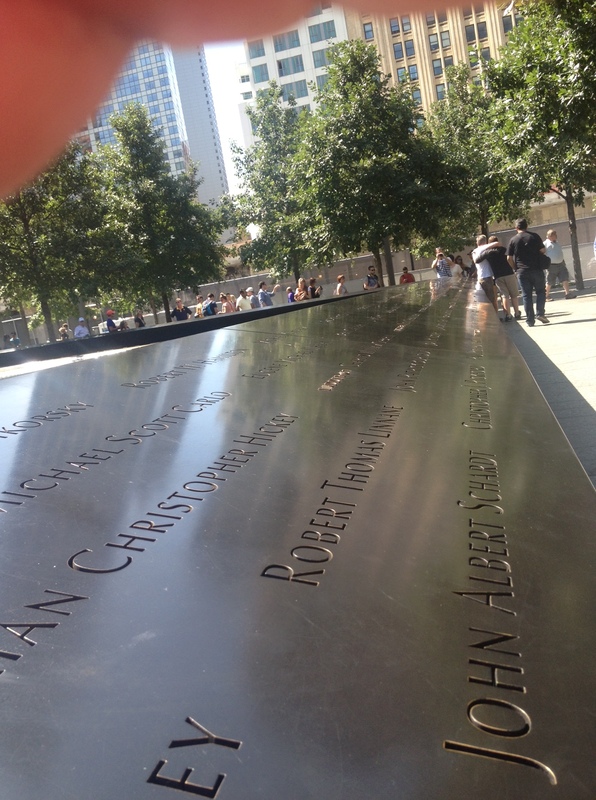 We were very recently in New York (late August 2014) and on a very sunny, gorgeous Saturday we decided to visit the 9/11 Memorial site, which is nearly fully completed. We had mixed feelings about going there as it feels a little ghoulish and after all when you are on holidays do you really want to visit some place that could upset you? For those who haven’t been there the site is dominated by a nearly complete huge new building, One World Trade Centre, which will be the tallest office building in the US soon to be occupied by thousands of workers. Alongside this building there are other smaller new office buildings along with the Memorial, which consists of two pools set in the footprint of the original twin towers with a museum close-by. These pools feature 30 foot waterfalls each descending into a centre void. The names of the victims are inscribed in bronze parapets, which surround the pools. The idea is simple and impactful even though I felt the centre voids were quite depressing and should instead have captured something more positive and uplifting. This didn’t stop the huge crowds visiting and taking photos, some strangely posing as if it were an exotic holiday location and not a place where victims were being remembered. The whole development unfortunately turned out to be a well documented troublesome political football. The final design was selected through an international competition that received 5,210 submissions. This must have been an impossible task – how can you properly and respectfully remember the victims. highlight the awfulness of the attacks and at the same time capture a resilient and positive spirit that will comfort and inspire all who visit? Much of what I saw I was expecting but a few things really surprised me, which I felt were really worth sharing. The memorial features the victims of both the September 2001 attack and the attack on 26th February, 1993. In 2001 there were 2,977 victims from over 90 nations. The oldest was 85 years old and the youngest was two. More than 400 of these were first responders who died performing their jobs. Six people died in the 1993 attack. When we walked around the two pools we noticed that there seemed to be no obvious sequence to the names that were inscribed on the surrounding bronze parapets. Reading the names you get a sense of the huge mix of nationalities that were working together on that tragic morning including plenty of Irish names. Some names had flowers inserted in between the lettering and some of the names were women who were carrying unborn children who were specifically mentioned, which was very poignant bringing home the reality of these terror attacks. We discovered that the names were arranged carefully based on what was described as ‘layers of meaningful adjacencies‘. People’s names were arranged depending on where they were on 9/11 and the relationships they shared with others who were killed on that day, honouring requests from victim’s families for specific names to be next to each other. This must have been a very complicated undertaking but it is a beautiful sentiment that reflects the togetherness of the victims and their surviving families. In between and around the two pools there are swamp white oak (I read the brochure!) trees carefully planted softening the whole area. In the middle of all of this there is one particular tree, which is a little different as it stands there with some unusual straps and supports around it. 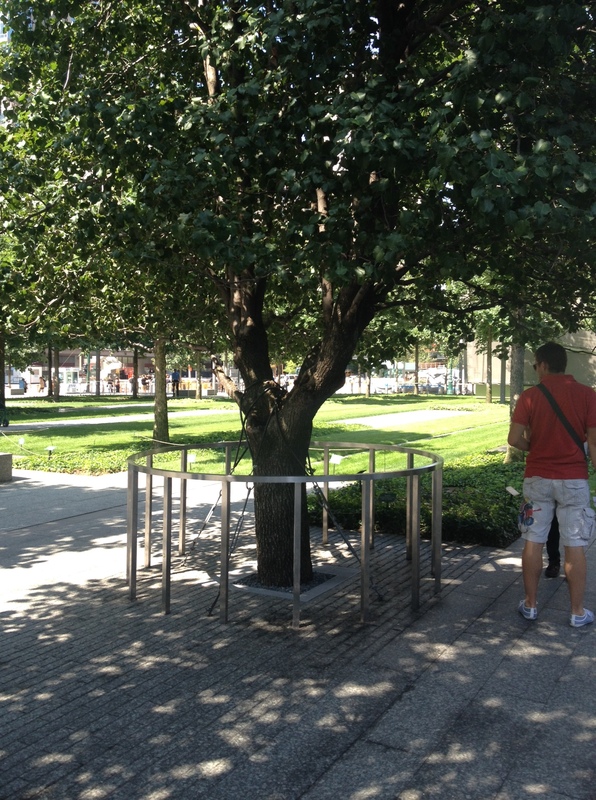 This tree is a Callery pear tree, which was found after 9/11 by the workers who were clearing the wreckage at ground zero. At this point in time it was reduced to a eight-foot-tall stump. This stump was nursed back to health in a New York City park and with much care it grew to 30 feet sprouting new branches.. There is a discrete little sign near this tree, which is rooted in its new home and it is attracting a lot of attention. Many of the visitors take photos near the tree but there is a huge desire by everyone to touch the ‘survivor tree‘. We touched it ourselves and it feels strangely reassuring and uplifting as it embodies the story of survival, resilience and hope. In some way maybe this simple tree is the very best way to remember the 2,983 people who perished in 1993 and 2001? The 9/11 memorial site will no doubt attract millions of tourists every year reflecting on the victims names around the two pools and reliving the tragic events as shown in the memorial museum. Next to them the offices will once again fill up with thousands of ‘suits‘ going about their busy jobs, just as the victims did before them showing how the world and New York does move on. This entry was posted on September 11, 2014 at 8:06 am and is filed under Bereavement, Friendship, History, Positivity, Tourism, Travel. You can follow any responses to this entry through the RSS 2.0 feed. You can leave a response, or trackback from your own site.